Karan Shroff leads Brand Marketing at Xiaomi India, and has been instrumental in driving the strategic creative campaigns of the Xiaomi brand in recent past. Having joined Xiaomi in July 2015 wherein he led national and global events across several markets; in a short span of three years, Karan moved on to run brand strategy projects and now heads the Xiaomi Brand Marketing team. Karan played a significant role in building Xiaomi’s widespread popularity among customers in India through iconic campaigns which include the latest KiskaBajaa campaign, and the Naya Note campaign, among many others. He spearheaded the Xiaomi India initiative that won a Guinness World Record achievement for the brand, creating the world’s largest lit mosaic (logo). Karan also conceptualized the successful #NoMiWithoutYou campaign which led to designing the world's largest grain mosaic, and fed over 500,000 people in India to celebrate a company milestone. The campaign went on to be named among the Top 10 Ad Campaigns of Q3 2017 for YouTube India. Karan serves on the jury board of the prestigious WOW Awards Asia Committeeand was recently awarded Marketer of the Year by IAA Leadership awards held by International Advertising Association (IAA) India Chapter. Karan has also been featured in Bloomberg-Quint’s Ace Team Initiative series as well as Campaign India’s A-List initiative. He was also named the Most Influential Youth Marketing Professional by Global Youth Marketing Forum 2019. With nearly 9 years of valuable marketing and events expertise, Karan’s prior contributions include working with Herbalife International India Pvt. Ltd as the Events Manager; and previously leading key events for Wizcraft International Pvt LTD and Bertelsmann earlier in his career. 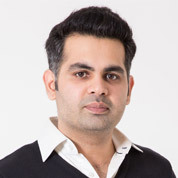 Karan has also founded Ignis events company and co-founded Pixie events, offering event management solutions to major clients such as Pepsi, Nike, HSBC, and Airtel to name a few.